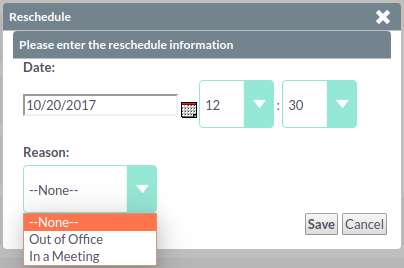 To reschedule a Call, you can click the 'Reschedule' button on the Detail View of a Call which has been defined as Outbound and Planned. Clicking the Reschedule button will produce a pop up or dialogue box up. This enables users to set the date and time for the rescheduled Call. 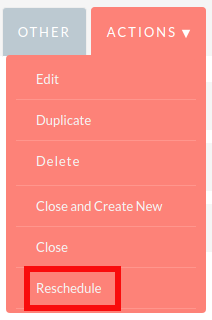 You can also select a reason for the incomplete/unsuccessful Call from the drop down list. Once the details have been defined, click the 'Save' button to save the Call. Once Saved, the Call is rescheduled for the new date and time. 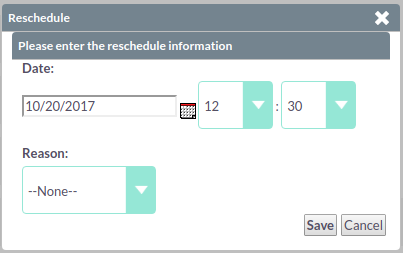 you can view all Call Reschedule history by clicking the 'Reschedule' tab on the Calls Detail View. System Administrator users can edit the reasons available in the Reschedule pop-up using the drop down editor. The drop down list used is called 'call_reschedule_dom'. In this chapter we have covered the functionality of the advanced modules. These modules have a very specific purpose - enabling users to improve processes and efficiently report on and manage data. In the next chapter, we will cover some third party modules which are part of the SuiteCRM product. These third party modules provide additional functionality to you such as teams and location mapping.